What does self care mean to you? 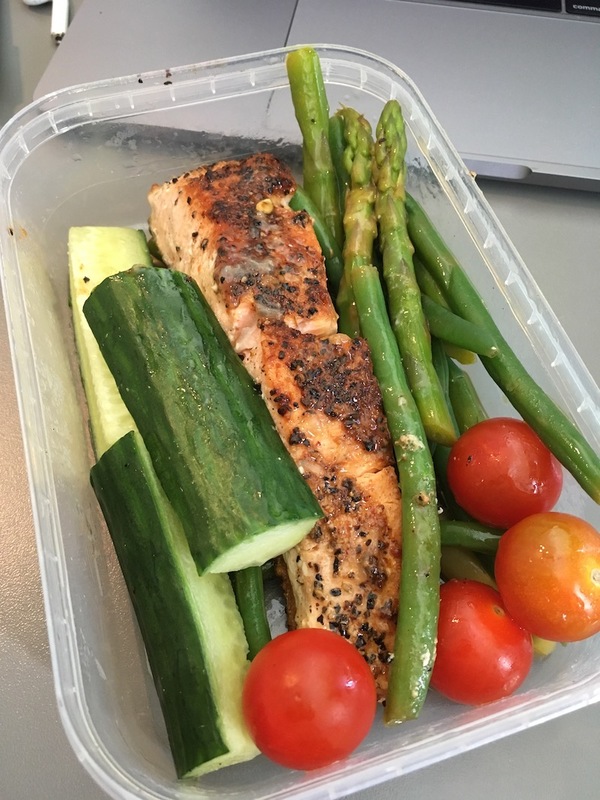 Is it fuelling your body on a healthy diet of vegetables and lean protein, or finding an extra five minutes in your morning to meditate or sit down with a coffee before work? Is it saluting the sun at a beachside yoga class, or treating yourself to a walk to the office in the sunshine? Or, is it grunting your way through a peanut butter and caramel cupcake after a hot and heady day at the office? So much grunting. That cake was GOOOOOD. For me, self care (or self love, being kind to yourself, whatever you want to call it), is many things. It’s waking up early on a weekend to ride my bike, or sweating from my eyes at the gym for a banging lunchtime PT session. It’s treating myself to a daily cycle commute on my beautiful road bike instead of lugging my heavy mountain bike round town (with double D-lock protection so this baby doesn’t get nicked like the last one). 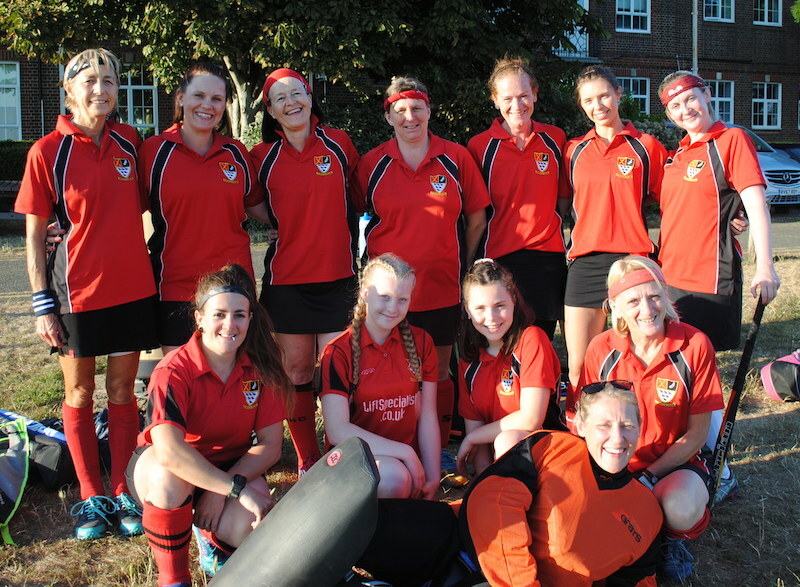 And it’s hanging out with the hockey girls on the pitch for another evening summer league match. Read why being part of a team gives me all the feels. 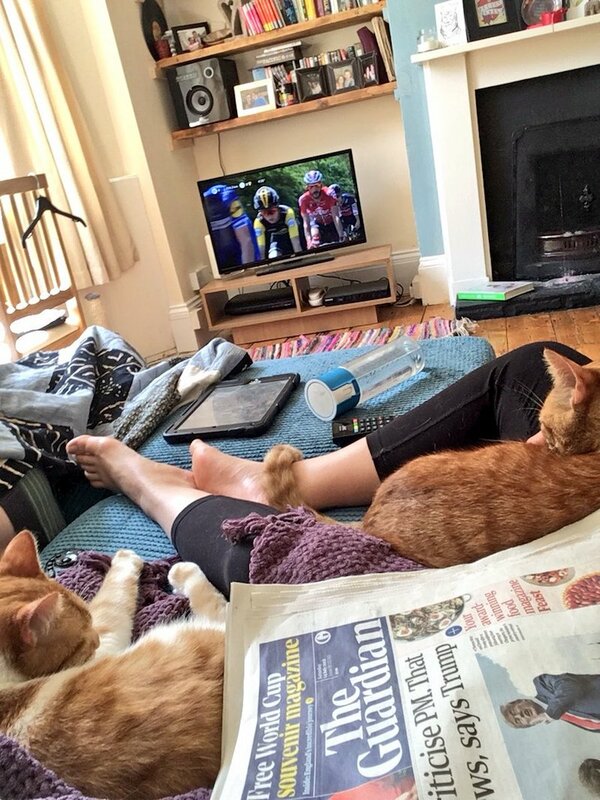 But it’s not all about physical activity. 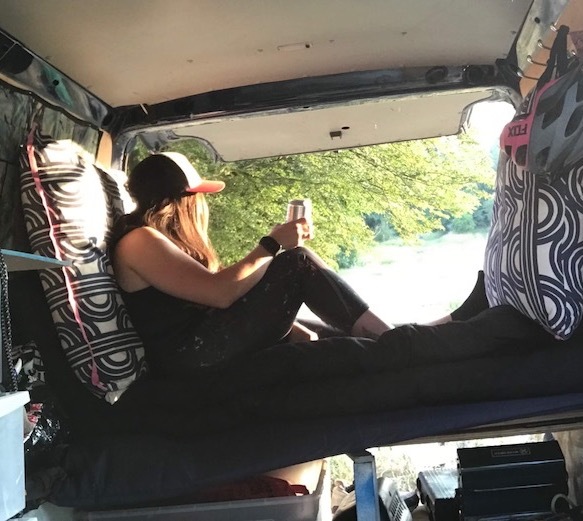 Sometimes I do actually slow down too, you know, and do things like booking an emergency floatation when things get a bit hectic, or swapping the Friday night pub visit for an evening round the campfire with my favourite. Sometimes, just sometimes, I stop talking about how much I need to go to yoga and actually make it to a class or home practice. 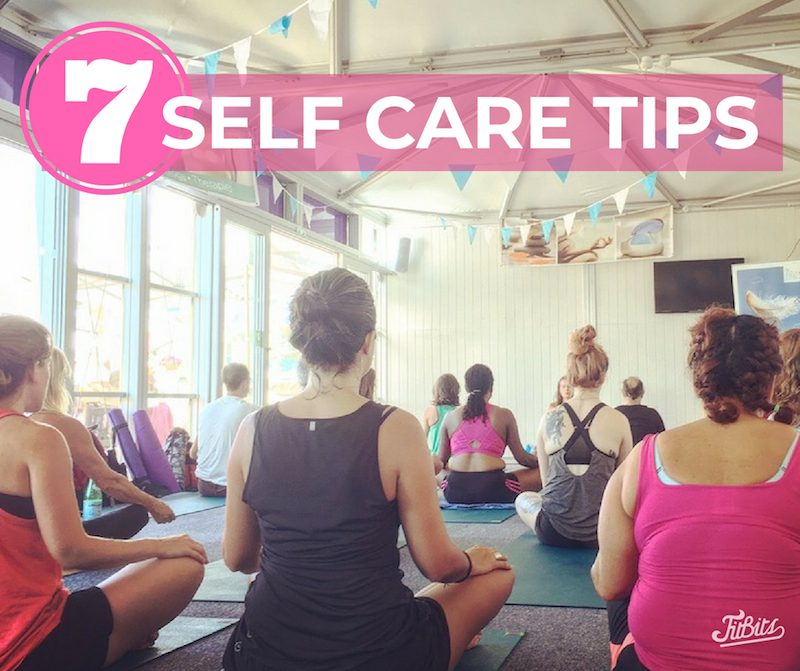 So for me, conscious self care – the kind where I’m actively aware that I need to do it rather than rushing around training all the time which comes naturally to me – is giving myself the greatest gift of all. Time. FACT: Stress is caused by not doing enough camping. The problem is I’ve never been great at doing it. I’ve always been that ‘busy’ person, 100 things on the go, with apparently little time to breathe. I live in my calendar, and my phone is my personal organiser for everything from my work schedule and appointments to fitness, fun, family and faffing about. EVERYTHING goes in my calendar, even tiny little reminders to buy milk or call mum or book the dentist. If it’s not in there, it gets forgotten, end of, and don’t even talk to me about the to do lists I’ve got going on in different notepads, apps and devices. Whilst I’m loving the course and learning new design skills that will 100% benefit me in the future (and this blog too as I finally migrate to WordPress), what I’m not loving is being stuck in a stuffy classroom during this heatwave, with 30 hot computers and sweaty bodies. I left the classroom today in a right old stress because I’d not been able to find a good WordPress theme for my portfolio site (anyone got any tips please let me know! ), and had trouble translating the horrific user experience that is the backend of 123-reg to set up my new site. It’s the first time I’ve been stressed at work in ages, actually, but it got me thinking about self care and how to step out of my funk so as not to let it drag me down for the whole evening. So with that in mind, here’s seven self care techniques you can use to reclaim that sense of calm. Or whatever else is your go-to comfort food. 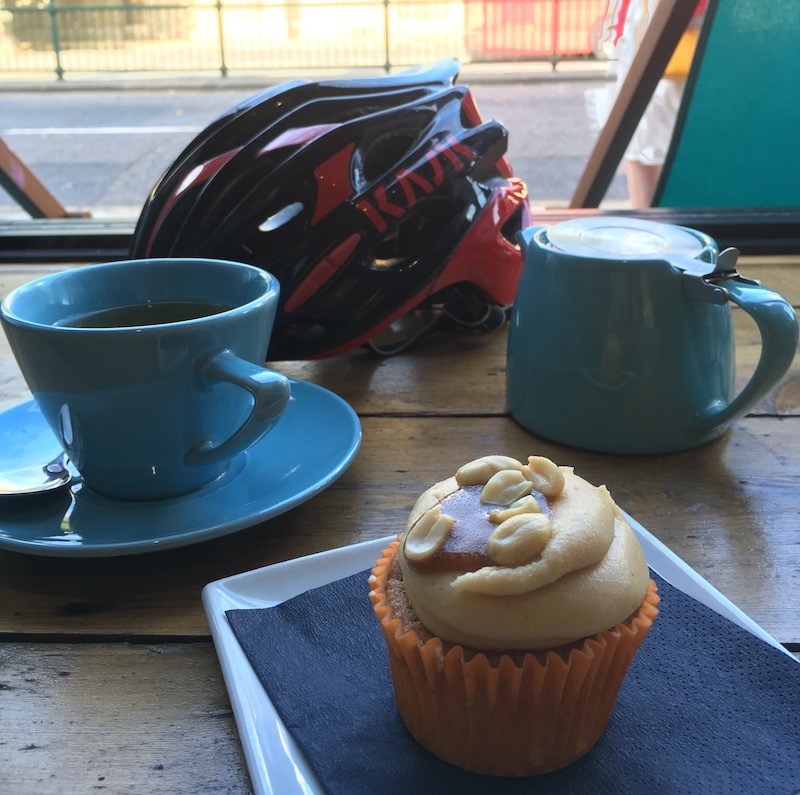 When I left the classroom today – early because I was in such a foul mood – I had the sole intention of locating the most badass, beautiful sugar fix I could find, and I’m glad to say I succeeded, thanks to Cloud 9 on London Road, Brighton. I rushed there so hard that when I got to the counter I had no idea what to order and spent 10minutes faffing about before realising the only sensible thing to do was to go for the peanut butter caramel cupcake. I’m not kidding, that was probably the best decision I’ve made all month. It was DIVINE. And just what I needed. No guilt, no scouring Pinterest for depressing infographics on how much exercise it’d take to work it off – just sit back, slow down and grunt appreciatively to myself for five sensational mouthfuls. Obviously. When your body is tight and your mind is frazzled, yoga is THE ONE and it gets me every time. This one’s really hard for me, and something I need to work on for sure. I can’t remember the last time I turned my phone off, can you? I used to leave it outside the bedroom at night so at least I would get out of bed before checking my emails in the morning but I’ve slipped back into putting it under my pillow as I sleep. Mainly to not annoy Chris when my alarm goes off for 6am PT and he’s getting up at 7. Now it’s back to being permanently attached to me like a drip and it’s gotta change. I’ve got better things to do than aimlessly scroll social media. I’ve always loved physical print. It must be the writer in me. Since I was a kid I’ve always had a thing about magazines or kept diaries, but recently I’ve let myself forget the joy of putting pen to paper and turning a page. The only time I really make time to read a magazine now is when flying, and that’s because the Internet isn’t available. How sad is that? On the weekends I sometimes buy a paper and then promptly sit on my phone next to it, but this Saturday I actually managed to read the whole thing and it was really quite nice. Admittedly, I did get my phone out to take a photo, but for a whole hour I was engrossed, and that’s what I miss. So I’m gonna stop saying I don’t have time to read and make time. Watch this space! 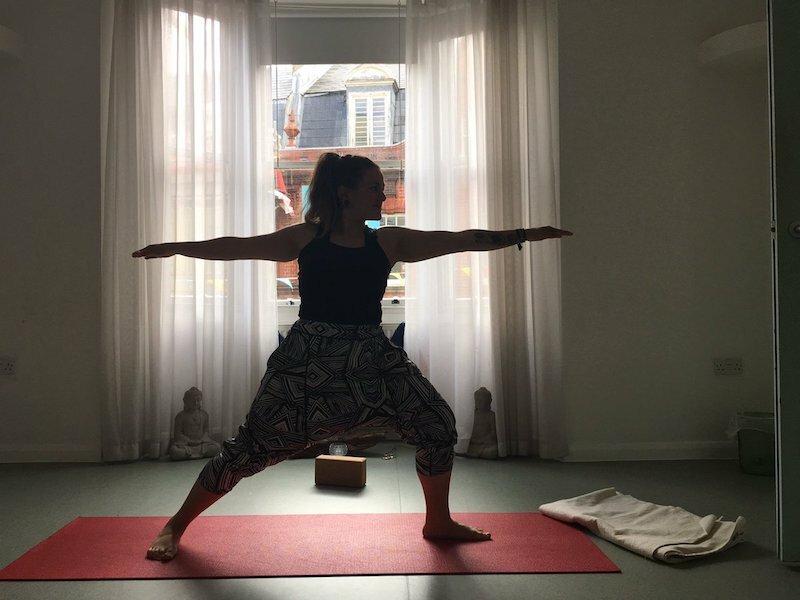 A few weeks ago I went to a wellbeing day at Anahata Health Clinic in Brighton, and after a yoga class had an amazing and much-needed deep tissue massage. Why is it we never realise how much tension we carry around with us until someone tries to massage it out? My therapist Raquel did a blinding job for the hour and I floated away all loose and lovely, vowing to never let my shoulders get that tight again. The Anahata clinic itself is hard to miss, with its bright red and yellow exterior complete with dragons to – in founder Deborah’s own words – ‘keep the bad stuff away’. 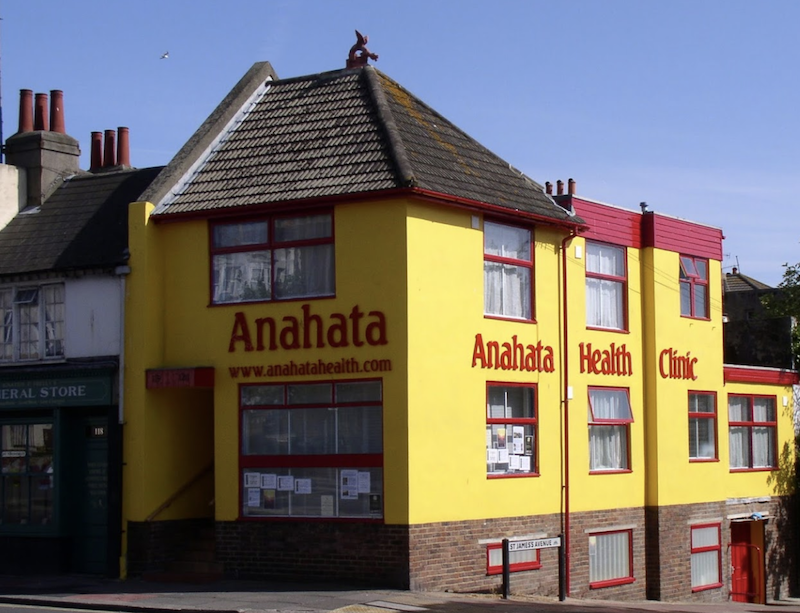 The vibe and energy of Anahata is one of a relaxed home and comfort, focused on community and low cost treatments and classes. Like most converted corner terrace houses, it’s deceivingly big on the inside and houses five treatment rooms, two movement studios, and 50 therapists offering therapies such as acupuncture, massage, reiki, life coaching and more. 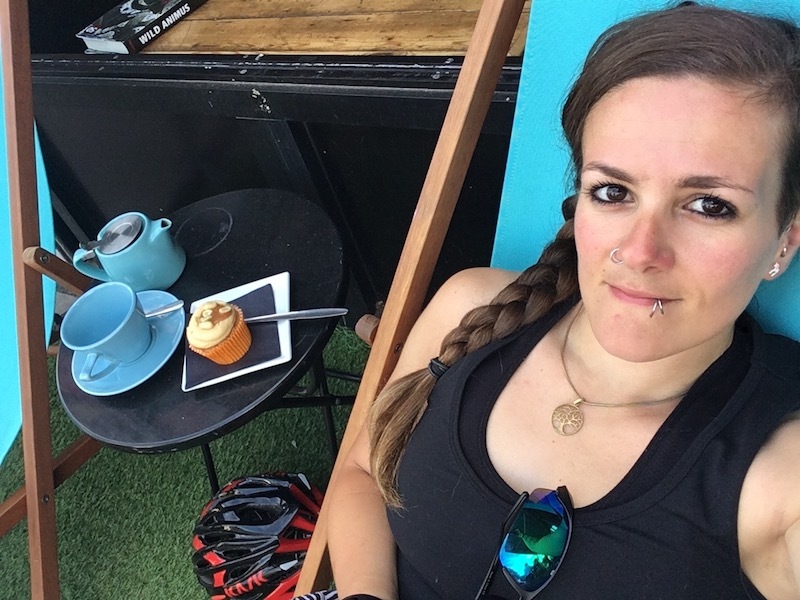 To make wellbeing accessible for all, therapists offer low cost sessions throughout the week, with a 60 minute massage available for just £25 on Wednesdays with Raquel, for example. Find out more about Anahata their website. 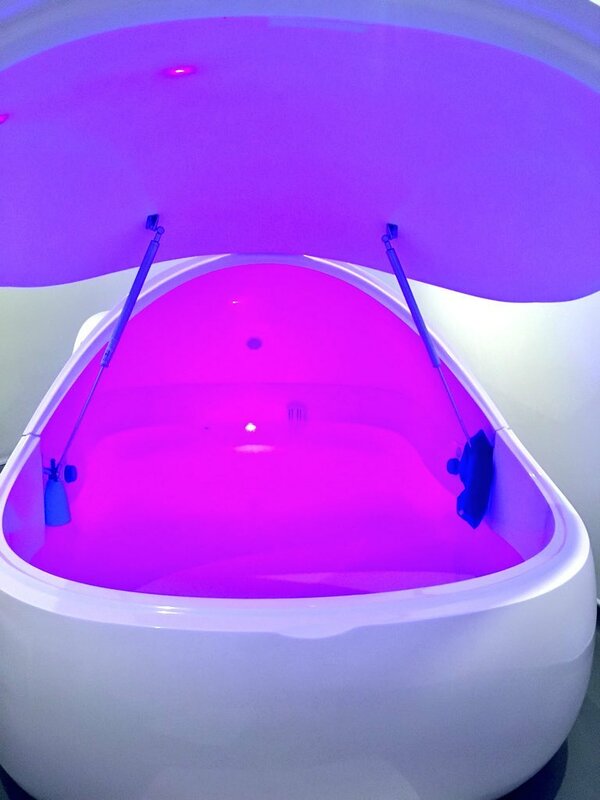 Read about the first time I tried floatation, and what happened when I did the three-day float challenge after injuring myself running. However you show your body and mind a bit of love, make sure you do it often. We’re on the go so much nowadays it can seem really hard to just stop, but all you really have to do is unplug for a little while. The notifications, messages and bombardment of information will all still be there when you get back from your self care sabbatical. So go on, take some time to treat yourself. You deserve it. Previous Post The F45 Challenge and me – results!